It’s a sometimes curious feeling, living in a city that doesn’t exist. You may think Inverness is a real place. 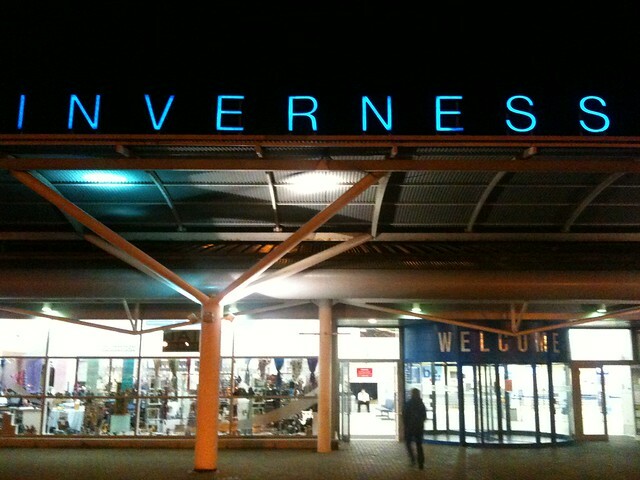 There are “Welcome to Inverness” road signs on the main roads as you approach it. You can walk its streets, see its sights, feel the fresh breeze and be deafened by the squawk of seagulls. That doesn’t mean it exists, though. Everything you sense is Inverness, isn’t really Inverness at all. Fear not, though. The problem is a political one, rather than a conceptual one. The problem, in essence, is that there is no political entity that defines the city of Inverness. Inverness was designated a Royal Burgh in the thirteenth century, though I have no idea what its geographical limit was at the time. Later, it was the county town of Inverness-shire and then a part of Inverness District Council, but those both included much more than the urban settlement, and now it is a part of the even larger Highland Council. There is an Inverness City Committee of the Highland Council, admittedly, but that extends way beyond the city to incorporate the Loch Ness area. Quite what the “Welcome to Inverness” road signs designate, then, is not clear because it’s certainly not any of the above. Meanwhile the Member of Parliament (for the UK parliament) is for a huge constituency (Inverness, Nairn, Badenoch and Strathspey), and the Member of the Scottish Parliament serves the slightly trimmer Inverness and Nairn constituency. So we know what, administratively, the city is a part of. What it consists of, however, is unknown. Even when Inverness was formally designated a city in 2000 as one of the “millennium cities”, the “letters patent” were handed to Highland Council rather than to any body with “Inverness” in its name. Then, when someone applied for a coat of arms for the new city, it was rejected in 2008 by the Lord Lyon, Scotland’s custodian of heraldry, because there was nothing to award the coat of arms to. Nothing to grant arms to. Let’s just dwell on that – there is nothing that can receive something on behalf of Inverness. Because it doesn’t exist, people. Inverness doesn’t exist! Everything we thought was real in our lives here in the city is a mere sham, a mirage, a deception. It’s like The Matrix, with more bureaucracy. The concept of the city has always posed various dilemmas and curiosities. Is Inverness airport in Inverness? Are the big suburbs, such as Smithton or Culloden, a part of the city? Does it even include the retail park and forthcoming new campus just to the east? And how about Clachnaharry, Dochgarroch or Milton of Leys? Who, frankly, knows? Inverness’s existential crisis has come to the fore again just recently, with the Inverness Courier reporting that the council is working simultaneously from two different definitions of the city. One is an old Royal Burgh boundary, and the other is the Inverness district boundary used as part of the Inner Moray Firth Local Development Plan. The article reports that Richard Laird, a local councillor in the city, is exploring the problem. He is trying to seek clarity because there is an impact on what areas qualify for certain pots of money and what the city as a whole is entitled to on account of its size. This all sounds very technical, but it’s not just an obscure administrative problem. When there are funding consequences, then it suddenly becomes very important. Not getting the funding you’re entitled to is potentially serious; whereas simply not existing is something you could live with. The Council is looking into the problem, according to the Courier article, and will report later on in 2013. In the meantime, Inverness waits for the truth. You basically want an Inverness city council but its like you’re not happy with Inverness ‘merely’ being the business epicentre and capital of a great region. And to think Highlands and Islands Enterprise get criticism for being too Inverness centric. Not sure that more bureaucracy is the answer. Merely defining the city in an unambiguous manner is nothing to do with more bureaucracy. Though while we’re at it, yes I do believe that an Inverness City Council (or perhaps even smaller authorities) would better serve people. Local government in Scotland is not exactly local, not least where councils don’t have the power to raise their own funds, or where there are geographically huge councils. In the Highlands, for instance, one authority is expected to cater for communities as far apart as Caithness, Skye and Lochaber. That’s not “local”, or fair – on anyone. If you compare Scotland with similarly sized countries elsewhere in Europe, our number of statutory local authorities (32) is tiny. Many other comparable countries have hundreds, if not thousands, which allows for real community engagement and real participation. Andy Wightman has done a lot of research on this. As long as technical services and backroom functions can be shared by councils, there’s not really any extra bureaucracy involved. Giving real power to towns, villages and communities in Scotland, is no more Inverness-centric than it is also Fort William-centric, Wick-centric, Portree-centric or, in short, community-centric and people-centric.